Taking our seats before the start of Miet Warlop’s ‘Dragging the Bone’ at HAU Hebbel Am Ufer, we are confronted with an arena of smoothly fashioned plaster forms. The onstage sculptural elements vary from more figurative casts of limbs and clothing to more abstract, minimalist creations. Some are self-supporting, others held up by metal stands. Standing silently like a sculpturally interpreted acropolis, the installation awaits the activation of a human presence. Warlop enters this peculiar field dressed all in black, with her hair covering her face. As the piece commences, an audio monologue proclaims the status of humour; a collection of inflatable white sculptures towards the back of the stage cackle along with the speech. Harmony between artist and the fruits of artistic production prevails at this early stage in the performance. 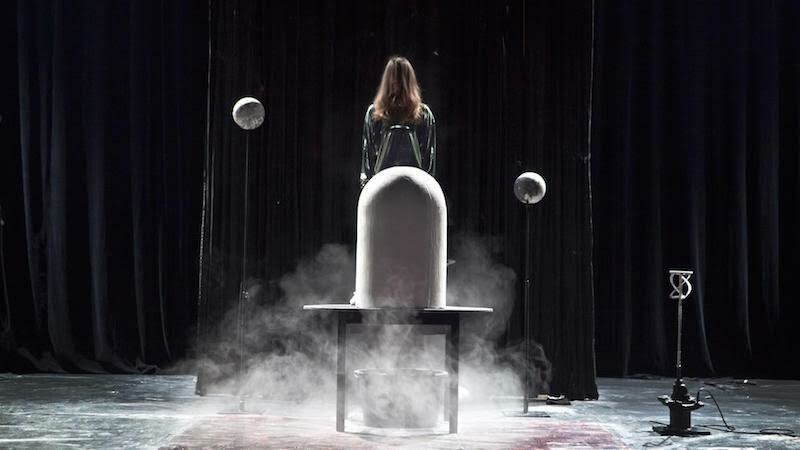 Warlop establishes herself early on as the protagonist, having designed and produced the work as well as performing alone. As she wrestles her way through the abundance of material, artist and medium become merged. Over and over again, the concept of a realised artwork is denounced and deconstructed. When artistic labour is involved, production is a never-ending endeavour. 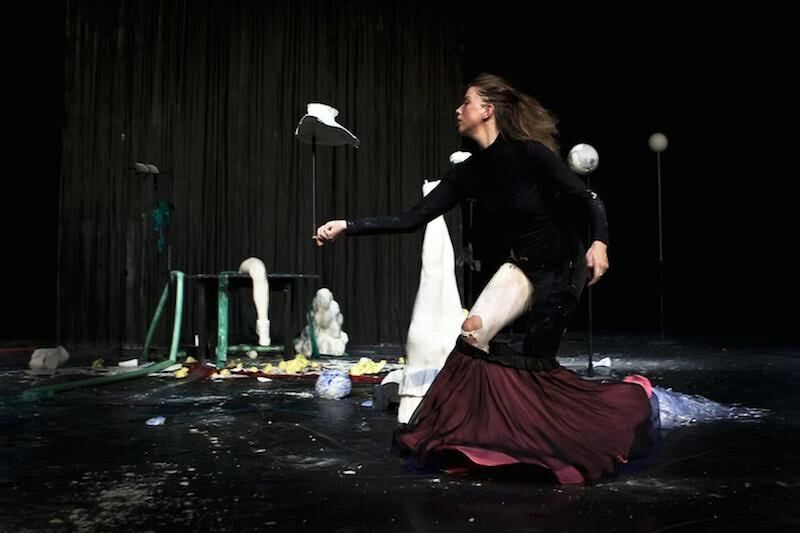 Plaster is Warlop’s supreme material of choice in this performance, which is shown projecting across all the stages of its life-span. We watch it tumbling into a bucket in powder form, a plaster-soaked rag drying on a rack, which we later see smashed to pieces once dried. The act of working with plaster is often confined to the unseen casting studio, but ‘Dragging the Bone’ over-exposes the perils of its production to us with pronounced extremity. 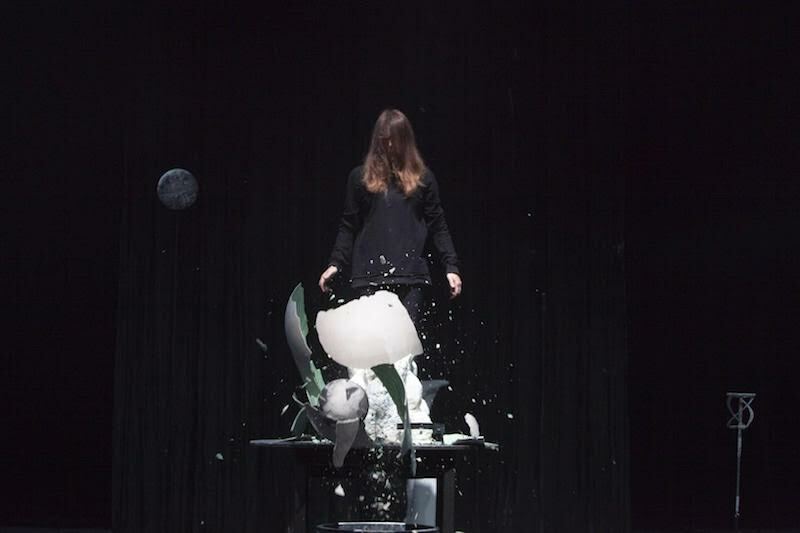 At the same time, Warlop’s frenzied destruction of her sculptural set heralds an assault on creative production; falling victim to the wrath of the artist, the seemingly finalised artworks around the stage meet dramatic ends. As we watch multiple casts be demolished, I sense certain audience members wince. Perhaps this reaction is testimony to the awareness of the painstaking process of casting, or the admiration for plaster that antiquity has drilled into us. Despite its absurdity, the entire performance feels packed with commentary, most notably a critique on the pressure on women to conform to beauty standards. Warlop periodically takes a break from smashing her sculptures in order to fling and pull her hair through a set of brushes elevated on a steel rod. The gesture draws some laughter from the audience, yet as she moves to do this a third time, her fatigued body language draws an unpreventable pathos as she tugs her hair free; we feel a certain guilt in indulging in this image as entertainment. Despite the manual labour she subjects herself to, there is inherently a grappling for approval, a striving for her own external perfection. Before she pours plaster from the height of a table into a bucket of water or rolls up crushed plaster fragments into plastic, her hair must not have knots. The most harrowing sector of the performance comes later when, wearing high heels, Warlop squeezes herself into a frilly plaster skirt. As if this is not torture enough, she proceeds to roll herself around the set. The sound of plaster and the artist’s bones knocking against the stage echoes throughout the theatre. Watching Warlop hurtle through and destroy some more upstage sculptures, the work evokes an element of voyeurism, as if witnessing a strip-tease turned violently on its head. Historically, the effect of theatre was contained within the creation of illusion, of transfixing audiences through smoke-and-mirror effects. Warlop’s work similarly transports us to an alternative reality in which we are catapulted along with her through a series of actions urgently needing completion. But it is all done in real-time, time even becomes an irrelevant notion, and while Warlop is performing for us, her activity is undeniably real. Watching her in this frontal theatre setup, we are at once distanced from Warlop’s turmoil and also distinctly present, embodied by her as she hurtles us through a sculptural crash course. As Warlop’s performance draws to a close and we look upon all the debris strewn across the stage, we are prompted to reflect on the unrelenting struggle of artistic process. Throughout the performance, Warlop’s activity communicates like a performed counteraction to the rhetoric of capitalism, which asserts that our worth is determined by our level of productivity. While initially ludicrous, her tasks become increasingly less out of kilter, as we witness Warlop tumble, slide, roll and dance through the outcomes of her artistic production. The piece is rife with references to the manufacture of art and the necessity for a human hand in its creation. Perhaps it is the presence of plaster with its historic fine art background that makes this association so explicit. Above all though, the impact of ‘Dragging the Bone’ lies in its generation of human empathy that allows us to place ourselves in Warlop’s position.